LEXINGTON, Ky. (Feb. 8, 2019) — Talia Allen wants to pay it forward. “When I was in elementary school, I went through a very hard time. I want to become a teacher to help kids, because I had teachers who helped me,” Allen said. Allen was among dozens of high school students from across Fayette County who visited the University of Kentucky Tuesday to practice skills they will need as educators. The Fayette County students are part of a local chapter of Educators Rising Kentucky, a club for middle and high school students interested in education-related careers. 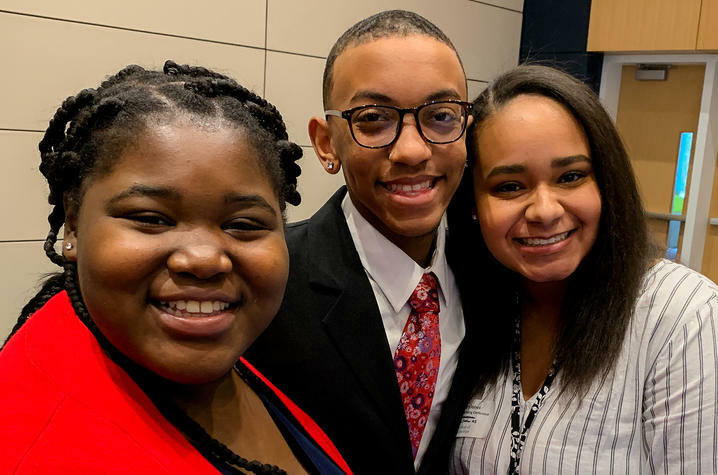 As the state affiliate, Educators Rising Kentucky and Phi Delta Kappa partner to create a national network that helps students build resources and create connections that can significantly impact educational opportunities through co-curricular and extracurricular activities. 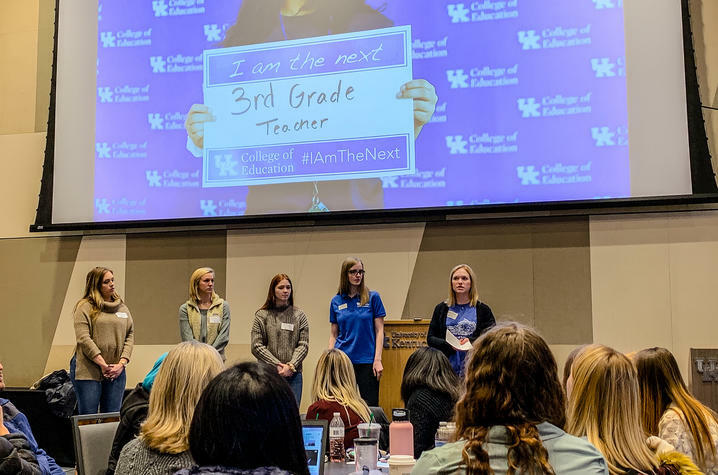 Faculty, staff and preservice teachers from the UK College of Education hosted Allen and many Fayette County classmates at the UK Gatton Student Center and served as judges and mentors for performance-based competitions. Students who place in the local competition move on to compete at the state level in March, in Bowling Green. “I think it’s important to come to UK now to see what becoming a teacher looks like early on. I want to be able to prepare and grow into the teacher I want to be,” Allen said. The event also offered current UK students, who are preservice teachers in the college’s teacher education program, an opportunity to bolster a rising generation of aspiring teachers by serving on a question-and-answer panel, shedding light on what to expect as college students and tips for successfully navigating campus life and responsibilities. “Events like these mean I am helping prepare the future. It’s fun to share the passion for education with these students,” said Sophie Robic, who is studying at UK to become an elementary teacher. The UK College of Education works with Educators Rising to provide early engagement in education career pathways. Research shows that teachers tend to work geographically close to the hometown where they attended school. This fact highlights the importance of local communities placing emphasis on creating a pipeline of accomplished teachers who are positioned to make a lasting difference — not only in the lives of their students, but also in the field of teaching more broadly. To learn more about becoming a teacher at the UK College of Education, visit education.uky.edu/future-students/.